Add amazing colour to your project with amazing smoke tint effect. The Smoke is a transparent coloured spray used to tint glass, windows, headlights or rear lights. The more you add the more coloured it will be and less transparent. Great for arts and crafts projects and so much more. Wraps, protects and changes colour with matte finish. It can be removed by peeling it, as if it were a conventional vinyl. Auto Levelling Additives for that perfect smooth finish. Long lasting, still removable after 10 years. You can clean Full dip with most soaps, and it will resist water, mud or pressure water cleaning. Apply the product approx. 20 cm range. Always parallel to the surface you are spraying. You can apply as many coats as you want, keeping in mind that the more you apply, the less transparent the surface becomes. But remember, that more coats you apply, the more durable it will be. The result will be better and more easily peeled if you want to remove in the future. Use less coats, two or three, then expect problems like hard to remove,poor finish and durability. Between coats, you must wait at minimum 10-30 minutes. Full dip will be touch dry in 10-30 minutes, but to be completely dry you need wait 24 hours. We recommend using a proper PPE mask during application. Once dried / cured, your project is ready to use. 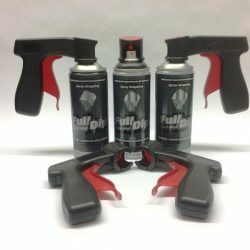 Instructions for use on full dip smoke black, please go to our How To Guide for aerosols. ** If using on a car or motorbike, make sure IT IS LEGAL IN YOUR COUNTRY before use on your lights or glass. Avalable in 750ml; 2.5L & 5L cans. 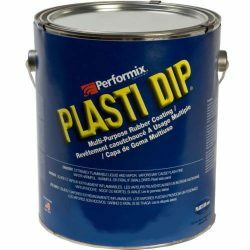 It gives a pearlescent sheen and a subtle white tint to any color Plasti Dip.